Hi everyone!! I'm so excited to post another My Pink Designer Post today :-) I made a card and a box for today. Contest is over--Thanks for playing! I think it's time for another giveaway! 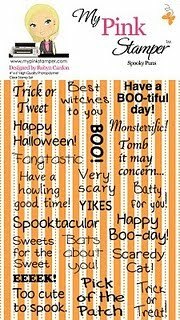 I have a My Pink Stamper Spooky Puns stamp set up for grabs. (Thanks to Robyn!!) Please just leave one comment, per person and a way for me to contact you. I will keep this open until Sunday night, September 26. Good luck! So cute! I LOVE the box, nice job! I love the box!! Sooooo cute! I do not have that set of stamps and I would love to win it. Love your card and box! Thanks for the great tip, I'll have to remember that! I love this cart, I just love all the fun stuff you can make with it! I would love a set of Robyn's stamps! I don't have any yet! Pathetic, I know! Thanks for the chance! what a great tip, i do that a lot myself and then sometimes I'm too lazy to re-cut.. cute card and box! I love the card and box. Would really like more details on how you did the box. Thanks for the tutorial - I love the box and looove that cartridge - I can't wait to try it! Thanks for your generous gift and the chance to win! These are super cute! Thanks for the inspiration - my daughters 3rd birthday is coming up and I just LOVE this box!!! I LOVE that little box...both are super cute!! Have a great day! I love the calmness yet creativity in your work .. looking at your card feels like taking a long fresh breath. thanks for sharing this wonderful project with us. I am a HUGE Halloween Fan! I love your stuff! I am glad I started following your blog. I am always on pinkstamper and saw your stuff... Love IT! This is great! Love that cupcake! I love your projects. Thanks for sharing. I love your blog!! What a super sweet box and card. I love cupcakes, they are so yummy! Thanks for sharing you talent, and for an awesome give away MPS stamps are awesome!! I love the box and would love to see a video of how you made it. You really have my mind swirling with ideas! Thanks so much for sharing and the giveaway!!!! I love that box and the card so cute. Super cute as always :) Thanks for the chance to win! These are so cute! I love the bright and cherry colors, and that box is adorable! Cute set! I have this cart and haven't used it yet. Thanks for the giveaway. Love your blog! Your card and box are adorable!! I love the colors. Very cute project, and thanks for the tip about the cutting! TFS! I love this card, I need to make a birthday card and there was yours so cute and quick!! Thanks for sharing. I just love your work. Thanks for the great giveaway! What a cute box!!! Thanks for a great giveaway!!! Your projects are great. Thanks for sharing and the blog candy. I love looking at your ideas, you are so creative. Thanks for the chance to win such a great stamp set! Love your projects, so glad you had a great vacation. Looking forward to seeing your next crafting creation! Love the box and card. Very cute. Thanks for the tip. I will have to try it out. Thanks for the chance to win the MPS stamps. I don't have this one and would love to win it. What a super cute set!!! Thanks for a chance to win MPS stamps. I just go into scrapbooking and card making!! I found your link from my pink stamper... I love your cute little card and box i'am going to check out the rest of your posts!! I love your project, Helen!!! :) I can definitely see why you were chosen as a My Pink Stamper design team member! I would LOVE to win a set of My Pink Stamper stamps, too! Love your card set. I've wanted that cart for awhile now! Thanks for the chance to win mps stamps they are my favorite!! Love your project and giveaway! You definately inspire me!! I don't have any of her stamps yet and would love to win some. Thanks for the chance to win! I don't have any of her stamps yet..remodeling the kitchen has kept me from buying anything! Thanks for inspiring us! I love the Pink Stamper stamps and would love to win this set. Thanks for the opportunity. Your projects are always fabulous. I love checking your blog and the fact that you give details of your projects. Thanks for always sharing.